Eurol in Dakar: Al-Attiyah kicks Dakar off with first stage win | Eurol B.V. The 2019 Dakar Rally has started well for the Eurol teams. Nasser Al-Attiyah took the first stage win of this Dakar with his Toyota Gazoo Racing Team after he beat last years winner. 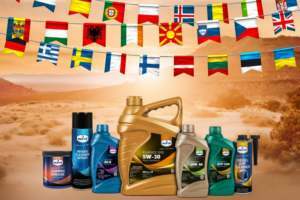 Eurol is supporting the participant of the 2019 Dakar Rally. The first stage was great for the Qatari who beat Carlos Sainz, the reigning winner of the Dakar Rally. Al-Attiyah told afterwards he was happy with the ca rand promised to keep the speed up in the coming days. Giniel de Villiers finished in sixth place with co-driver Dirk von Zitzewitz. Bernhard ten Brinke had a solid day and reached the finish in eighth place. Tim and Tom Coronel did a complete rebuild of their Jefferies Dakar Buggy over the year and had a promising but tricky start in the first stage. The Coronel brothers had a good day an finished in 36th place. The Dutchmen were 16 minutes slower than Al-Attiyah. Sometimes you need a bit of luck in the Dakar Rally. That was the case for Janus van Kasteren and his crew during the first stage. The turbocharger of the Renault truck was damaged and had to changed before the stage. Due to the delay at the start, the team had one hour to complete the change and they managed to do it. Van Kasteren finished in 15th place on the first day. Martin van den Brink was a bit quicker, he finished 13th although he lost some time during the search of a waypoint. The leader of Mammoet Rallysport was nevertheless happy with the first day. The Riwald Dakar Team had a great start of the 2019 Dakar Rally. Gert Huzink finished in 16th and lost only 12 minutes to the leaders in the race. Ed Wigman, who provides the fast assistance for Huzink, reached the finish in 24th.